We can produce a variety of rulers in different scales and rivet them to produce the fan scale for ease of use. 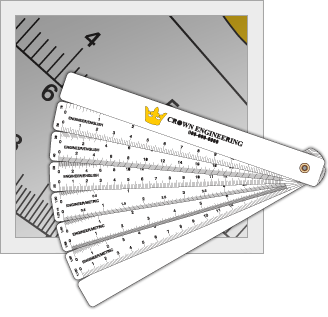 This pivoting ruler allows your customer to have several blades of rulers riveted together to form a single neatly packaged promotional item. Rulers can be printed on one side or both, doubling the number of scales presented. 7.875" x .875" x .030"